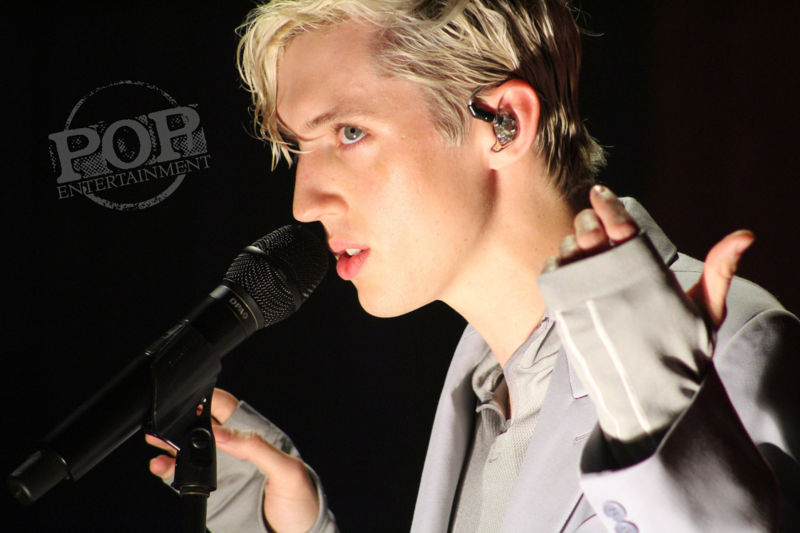 This past weekend, Australian singer Troye Sivan brought his “Bloom Tour” to the Tower Theater in Upper Darby. The show didn’t sell out, but the audience was super loud and excited to see Troye and his opening acts, Leland and Kim Petras. Leland opened the show as concert goers were entering the building after standing in the huge line outside. His energy was crazy as he was getting the audience amped up for the following act. Kim Petras came out a few moments later and the crowd went nuts. They were all dancing and singing along to her songs. Many concertgoers knew her songs and were singing word for word as her set came to an end. It was time for Troye to come out on stage and perform. He opened with “Seventeen” which is the first song on his most recent album Bloom. During the first half of the song it was just him, a microphone and a red curtain as the backdrop until the curtain dropped and revealed his set; lots of lights and stairs leading up to an elevated stage. Then he began to sing “Bloom” the song that inspired the title of his second album and the tour. After doing a few more song off Bloom, Troye did a few songs from his debut album Blue Neighborhood, such as “Fools” and “Wild.” However, during “Fools” there were technical difficulties and they had to skip it midway through and continued on with the show. To make it up to the crowd, a little later after a few slower songs, he performed “1999” – his newest song with Charli XCX – for the first time live. The audience was ecstatic. He made sure to make it feel like a safe space for anyone who wanted to come and have a good time with friends or loved ones. I would 100% recommend listening to Troye Sivan if you haven’t already. I consider you go see him live, he puts on an amazing performance and gives off great energy to the crowd. Copyright ©2018 PopEntertainment.com. All rights reserved. Posted: October 9, 2018. Tags: 1999, 2018, Australia, Better Now, Bloom, Bloom Tour, Blue Neighborhood, Charli XCX, Concert Photo Album, Concert Photography, Concert Photos, concert review, Fools, Kim Petras, Leland, My My My!, October 6, PA, PopEntertainment.com, Post Malone, Seventeen, tower theater, Troye Sivan, Upper Darby, Wild, Youth. Bookmark the permalink.